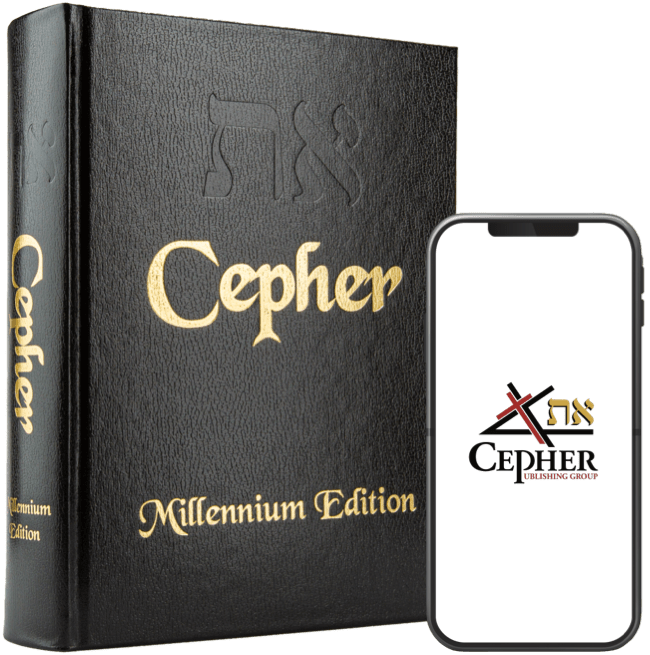 Recently, one friend contacted me and asked the question: I noticed the Cepher Bible [sic] changed description of Yahushua [sic] from polished bronze to polished brass. There is a huge difference. (Daniel 10:5 6.) Why would you do this? Then I lifted up את eth-my eyes, and looked, and behold a certain man clothed in linen, whose loins were girded with fine gold of Uphaz: 6 His body also was like the beryl, and his face as the appearance of lightning, and his eyes as lamps of fire, and his arms and his feet like in color to polished brass, and the voice of his words like the voice of a multitude. His body was like topaz, his face like lightning, his eyes like flaming torches, his arms and legs like the gleam of burnished bronze, and his voice like the sound of a multitude. His body was like beryl, his face like the appearance of lightning, his eyes like torches of fire, his arms and feet like burnished bronze in color, and the sound of his words like the voice of a multitude. His body also was like the Chrysolite, and his face (to look upon) like the lightning, and his eyes as lamps of fire, and his arms and his feet were like in color to polished brass, and the voice of his words was like the voice of a multitude. His body was like beryl, his face looked like lightning and his eyes like fiery torches; his arms and feet were the color of burnished bronze; and when he spoke, it sounded like the roar of a crowd. His body also was like the beryl, and his face as the appearance of lightning, and his eyes as flaming torches, and his arms and his feet like unto burnished brass, and the voice of his words like the voice of a multitude. His geviyah (body) also was like the chrysolite, and his face like the appearance of lightning, and his eyes like torches of eish, and his zero’ot (arms) and his raglayim (feet) like in color to polished bronze, and the sound of his words like the kol hamon (voice of a multitude). Y su cuerpo era como piedra de Tarsis, y su rostro parecía un relámpago, y sus ojos como antorchas de fuego, y sus brazos y sus pies como de color de metal resplandeciente [glowing metal], y la voz de sus palabras como la voz de ejército. Και And το σώμα αυτού his body ως was as θαρσείς Tharsis stone, και and το πρόσωπον αυτού his face ωσεί as όρασις a sight αστραπής of lightning, και and οι οφθαλμοί αυτού his eyes ωσεί as λαμπάδες lamps πυρός of fire, και and οι βραχίονες αυτού his arms και and τα σκέλη αυτού his legs ωσεί as όρασις the sight χαλκού of brass στίλβοντος shining, και and η the φωνή sound των λόγων αυτού of his words ως as φωνή a sound όχλου of a multitude. Dan 10:6 וגויתו U’geviyah – And a body כתרשׁישׁ k’tarshish – of topaz ופניו u’paniym[u] and his face כמראה k’mareh – the appearance of ברק barak - lightning ועיניו u’ayiniu – and his eyes כלפידי k’lapiyd – were shining אשׁ ish - fire וזרעתיו u’tsera’othi’u – and his arms ומרגלתיו u’margilothiu - and his feet כעין k’ayin – to color נחשׁת nechosheth – copper, or of brass* קלל qalal - polished וקול v’qol – and calling דבריו debariu – his words כקול k’qol – to call המון hamon – a noise. * nechosheth (נְחֹשֶׁת) (Strong's H5178): copper, hence, something made of that metal, i.e. coin, a fetter; figuratively, base (as compared with gold or silver):—brasen, brass, chain, copper, fetter (of brass), filthiness, steel. [We note that the word bronze does not appear]. Ex 27:4; Ex 35:16; Ex 38:4; Ex 38:30; Ex 39:39; Le 6:28; Nu 16:39; 1Ki 4:13; 1Ki 7:30; 1Ki 8:64; 1Ki 14:27; 2Ki 16:14; 2Ki 16:15; 2Ki 16:17 (the brasen serpent called Nehushtan); Jer 1:18; Jer 15:20; Jer 52:17; Eze 9:2; 2Ch 1:5; 2Ch 1:6; 2Ch 6:13;2Ch 7:7. According to Diffen, Brass and Bronze are metal alloys used extensively in everyday objects. While brass is an alloy of copper and zinc, bronze is an alloy consisting mainly of copper, combined most often with tin, but at times also with other metals. Owing to their properties, these two alloys have various uses. Brass has a higher malleability than zinc or copper. Low melting point (900 c); flows when melted. Combinations of iron, aluminum, silicon & manganese make brass corrosion resistant. Susceptible to stress cracking when exposed to ammonia. It is not as hard as steel. Brass is any alloy of copper and zinc and its color is a muted yellow, somewhat similar to gold, but duller. Brass has been used for decorative purposes, for low-friction applications such as locks, gears, doorknobs, ammunition, or valves). It is often used in modern day plumbing and electronics, and is commonly found in musical instruments such as trumpets, French horns, trombones, baritones, tubas, cornets, bugles and other brass horns, and is also used for cymbals. Bronze, on the other hand, is a metal alloy consisting primarily of copper, usually with tin as the main additive, but sometimes with other elements such as phosphorus, manganese, aluminum, or silicon. Bronze is hard and brittle. It melts at 950 centigrade but depends on amount of tin present. Bronze resists corrosion (especially seawater corrosion) and metal fatigue more than steel and is also a better conductor of heat and electricity than most steels. Unlike brass, its color is reddish brown. Bronze is used in boat and ship fittings, propellers and submerged bearings because of resistance to salt water corrosion. It has been widely used for cast bronze sculpture; and in the modern world, it is used for clips, bearings, electrical connectors and springs. Given that all of the ancient sources did not use a term that can be construed as bronze, how did we get the bronze in all of these interpretations?